Think there are no hotels for Indianapolis? Think again! To ensure the success of the July 8 DCI Indianapolis event, the Indianapolis Convention and Vistors Association has gone above and beyond for DCI fans. The folks in Indy have set aside blocks of hotel rooms specifically for fans coming to see the Central Division Championships. These rooms will be available exclusively for DCI fans. You can reserve your room at the ICVA's Web site right now. 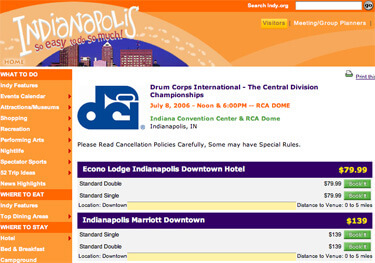 Check out the DCI page on www.indy.org/drumcorps and pick your hotel. Or you can call 800.974.4639 for more hotel information. Tickets for the July 8 Central Division Championships are on sale. Find more information or purchase tickets.